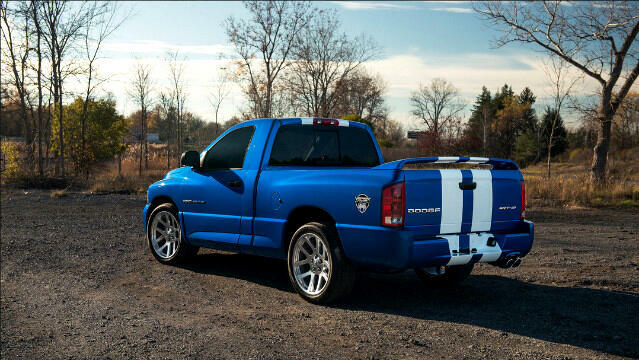 This 2,770-mile, 2004 Dodge Ram SRT-10 Viper Club of America Limited Edition is a rare bird. Listed as number 44 of 50 Dodge Ram Viper V-10 VCA Editions built in 2004, and the only example painted in Viper Electric Blue with white stripes, it was awarded through a raffle conducted by the Viper Club of America and delivered to the lucky winner at the 2004 Daytona 500. This Dodge Ram V-10 comes with the congratulatory letter, Ringgold Dodge window sticker and factory paperwork. Powered by a multi-port injected 8.3L/500 HP Viper V-10 engine and backed by a Borg Warner T56 6-speed transmission, the 2004 Dodge Ram SRT-10driven by NASCAR star Brendon Gaughnset a record at 154.587 MPH on February 2, 2004. Other noteworthy data generated from that session included 0-60 MPH times at 4.9-seconds, a time of 13.8-seconds in the quarter mile, and a .92G on the skid pad. Suspension on the Dodge Ram SRT-10 consisted of independent front suspension with rack-and-pinion steering with a Dana 60 bringing up the rear. Special sport-tuned springs are dampened by not four, but a total of five Bilstein gas-charged shock absorbersthe extra shock absorber on the rear eliminated wheel hop. All the modifications brought the ride height down a full inch at the front and 2.5-inches at the rear. Stopping power on the Dodge Ram SRT-10 is handled by a set of 15-inch diameter front and 14-inch diameter rear vented-rotors 4-wheel disc brakes. Rolling stock consists of 22-inch machine-polished 10-spoke wheels and Goodyear radials. Inside, the 2004 Dodge Ram SRT-10s Best in Class Interior features heavily bolstered leather racing seats, SRT badging and an iconic Hurst shifter. Exterior treatments include a distinctive hood, Le Mans-type racing stripes and a rear deck spoiler. This particular one-off example of a Dodge Ram SRT-10 also comes with the car cover.